A young man has landed in big trouble after crashing a new Benz in Delta state yesterday morning. 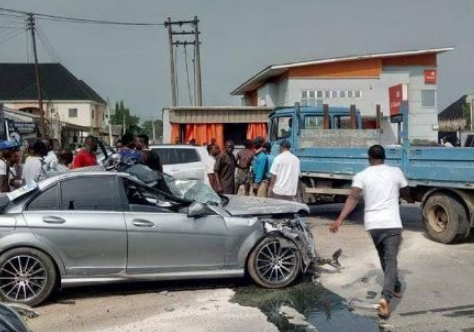 The guy, according to Macaulay Rume, was high speeding with a borrowed Benz when he had an accident with a Nikoro Block Industry Truck and crashed the Benz badly. He only sustained Minor Injuries but the expensive car was seriously damaged. 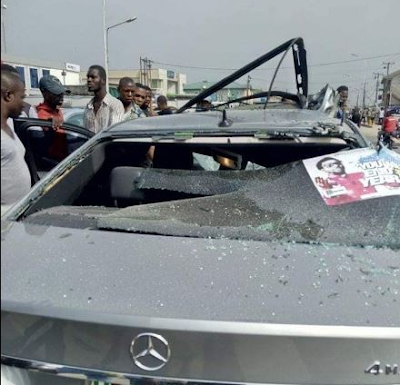 'One guy go use person Benz take jam Nikoro Block Industry truck. This accident happen just now close to GT Bank. The guy wey use the Benz take go jam the truck so, nor be him get am. Na somebody nai give am key, as he use over speed take go jam truck. 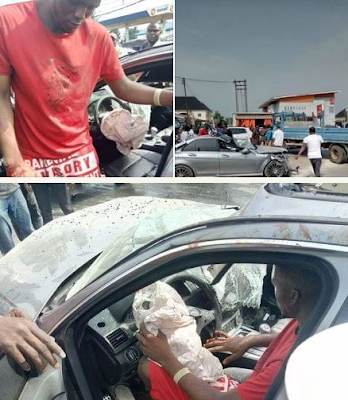 To tell you say the guy speed pass fast and furious, naso airbag burst.